Piper, formerly Lucky, aka You Gotta Haveit, is a handsome, white and brindle, almost 9-year-old male, born April 18, 2000. Piper’s sire is the famous Molotov and his dam is Ees Speed Kick. Piper’s racing record consists of 127 races, starting at the Derby Lane track in St. Peterborough, FL, on June 18, 2002, and moving to Southland in West Memphis, Arkansas and Wheeling Downs in West Virginia before his final retirement on July 23, 2004. Piper was adopted, but due to the owner’s career change, he is now looking for his final forever home. 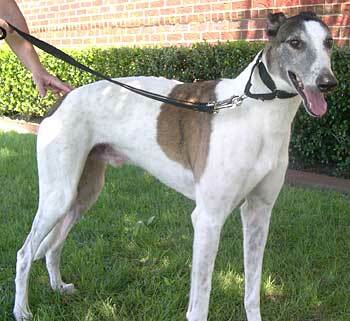 Piper is presently in a foster home with 3 other greyhounds – he is very congenial and sweet. Piper is cat and small animal tolerant.